Ruthless stars Ruth, a scrawny 16-year-old girl who is obsessed with Marathon City’s mysterious hero, the Grey Phantom. Ruth is bullied by the girls at school, her stepmom, and her lecherous boss. Life is constantly threatening to crush Ruth, but she overcomes daily torment to take care of her younger sister, Cindy, the light of her life. When tragedy strikes and Ruth’s world falls apart, she must make a terrible choice. When tragedy strikes, do you become a hero, or do you become…Ruthless. 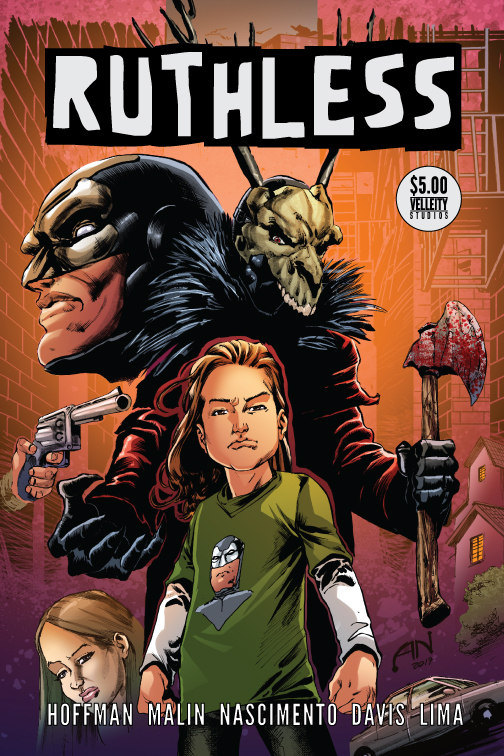 Ruthless #1 is the first of a six-issue series by Velleity Studios. Written by Chris Hoffman (Salt City Strangers) and Andrew Malin (The Mighty Trümph), drawn by the incomparable Alexandre Nascimento (Salt City Strangers, Rage), and inked by Tyler Davis (The Mighty Trümph), with cover colors by Dijjo Lima (Titan Comics).